Shepheard & Todd, Kitson and Co, John Fowler, J&H McLaren, Hudswell Clarke, Manning Wardle, Hunslet Engine Co and E.B.Wilson are names which many who are interested in steam engines will recognise at least a few of. These companies all operated next door or across the road from each other making Hunslet very much a neighbourhood of engine builders. To understand why this happened we need to look at a little of the history of these companies, and ideally to look at the area itself to try and get an idea of how it might have been years ago when the whole area was a mass of engineering companies. In 1837 Charles Todd left Fenton, Murray & Jackson's of Holbeck to establish a new firm with James Kitson and financial backer David Laird. The first engine works is said to have been established in old mill buildings on Pearson Street leased from John Fretwell. The reason the firm was established here was largely due to family connections. John Fretwell had a great niece called Ann who was married to James Kitson and a niece called Isabelle who was married to Charles Todd. The firm built 6 locos for the Liverpool and Manchester Railway, of which Lion still survives in Liverpool Museum. Legend has it that when the first engine was built it was too big to get it out of the mill’s doorways and a hole had to be knocked in the wall. The use of old mill buildings must have been very short lived however as on the 1st September 1837 the firm advertised in the Leeds Mercury that they were working in 'entirely new buidlings erected for the purpose.' The Todd Kitson & Laird partnership was short lived and in late 1939 Kitson & Laird formed the Airedale Foundry on the north side of Pearson street while Todd teamed up with John Shepheard to form Shepheard & Todd’s Railway Foundry on the south side of the street. The Kitson & Laird partnership didn’t last much longer and in 1842 Laird left and James Kitson formed a new partnership with Isaac Thompson, and William Watson Hewitson to form Kitson, Thompson and Hewitson. The company just became known as Kitson & Co in 1863 following the death of Hewitson and with Thompson having retired in 1858. Kitsons produced around 5500 locomotives in the Airedale Foundry until 1938. The site was then acquired by J&H McLaren who had previously built traction engines in the nearby Midland Engine Works and were at the time building the increasingly popular diesel engines. Many of the diesel engines made by McLarens were fitted to locomotives including a number of those built by local firms. Renamed the Airedale Works the site produced diesel engines until 1959 when J&H McLaren’s then parent company Hawker Sidley closed the outdated factory in a streamlining exercise. One part of the McLaren operation involved in specialist welding remained until 1965 as McLaren Fabrications in Kitson’s former M shop and a building known as the California Shop, this was the former V Shop of Kitson’s works. Amongst the fabrication work carried out here were parts for the class 31 diesels being built by Brush, another Hawker Sidley company. Brush survive to this day, the last builder of mainline locomotives in this country. Of the former Kitson works one building survives, the former California Shop of McLarens and V shop of Kitsons. 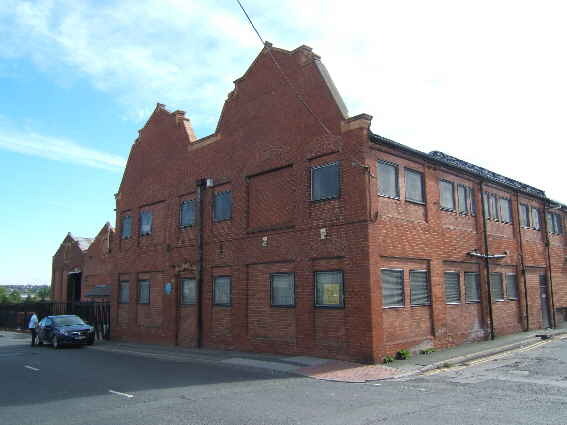 This building can be seen on the corner of Ivory Street and Leathley Road and is now known as California house, though the building has been modified a great deal. To give an idea of the problems associated with having so many engineering companies located in a relatively small area it is worth remembering this story. The Forge at Fowler’s was situated adjacent to McLaren’s M shop in the Airedale Works that had previously been a part of Kitson’s works. Some precision machining took place in the M shop and many pieces of work were ruined as the ground shuddered when Fowler’s used their large drop hammer. To resolve these problems Fowler’s had to phone McLaren’s to warn them when they were going to use the drop hammers. Another small part of the Kitson works to survive is this stretch of perimeter wall at what is now the back of Costco’s car park. This wall would have had been the edge of a courtyard an Fowler's works and had a row of lean to buildings on the other side in Kitson's works. A building built in the 1950s as McLaren’s service department also survives on Kitson Street. A name that became one of the leading names in steam traction engine production, John Fowler originally worked with other firms to supply such agricultural equipment. In 1860 Kitson, Thompson and Hewitson began producing a number of ploughing engines to Fowler orders. It was this partnership that lead to John Fowler establishing his own works alongside the Airedale Foundry. Fowlers produced huge numbers of traction engines, ploughing equipment and steam locomotives, and went on to produce diesel locomotives until the mid 1960s. The main part of Fowler’s works has been demolished and the site is now occupied by a Costco store, a plaque in the car park tells visitors of the works that once occupied the site. One building of the Fowler works does survive. 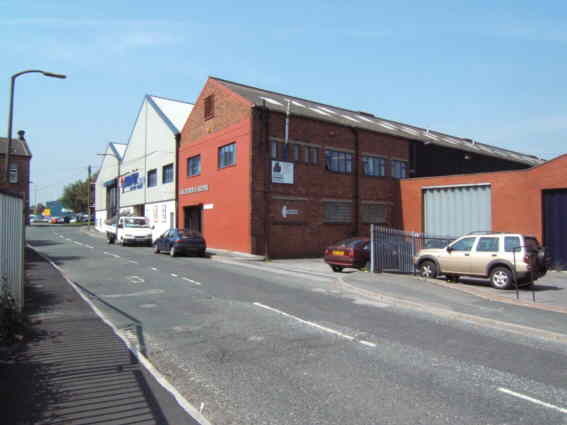 This building can be found between Leathley Street and the Crown Point Retail Park that now occupies what was once the site of the Midland Railway’s Hunslet West goods sheds. 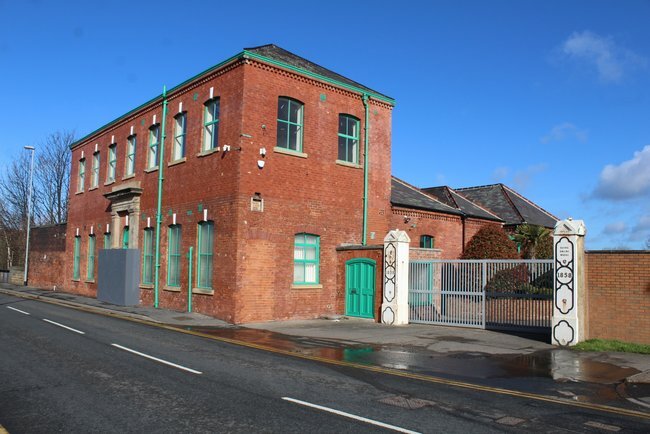 The building was the locomotive works and Fowler locomotives were assembled here. Many of Fowler's official works photos were taken at this location and a number of photos of locomotives and traction engines taken here can be found. When the modern steel shutters are open on the Leathley Street side of the building the old arched doorways of the building can be seen, also look out for the rails that are still set in to the workshop floors. There are rails to a number of gauges since much of Fowler's locomotive production was for narrow gauge industrial railways. The Shepherd & Todd partership also didn’t last very long as Todd departed to set up another firm, The Sun Foundry on Dewsbury road. Todd's place at the Railway Foundry was then taken by Edward Brown Wilson. The first Railway Foundry works which can be seen in the centre of the map, the quadrangle as it became known, survived as stores for many years after it had been superseded by newer buildings, though it was in a very dilapidated state. 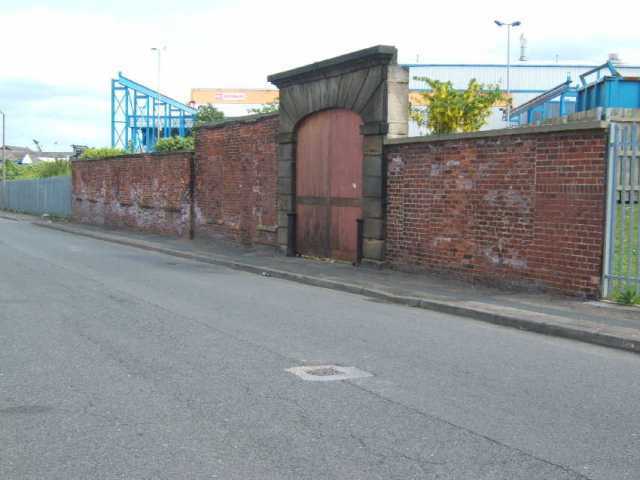 All that remains to this day is an archway on Pearson Street through which locomotives would have emerged from the old Railway Foundry. Jack Lane was once the address of four engine building companies, today two of their head offices still survive. Walking along Jack Lane from the Leeds the first one we come to is the former office of Manning Wardle. Also still in evidence is the gateway to the former works with the cast iron gateposts bearing the inscription "BOYNE ENGINE WORKS", though nothing survives of the works themselves. Manning Wardle were the first company to emerge in the wake of E. B.Wilson’s and their early engines were practically identical to E. B.Wilson products. People within E. B.Wilson’s, including manager Alexander Campbell had established the new works alongside the Railway Foundry. Opening in 1858 for the first year or so it started business as a general engineering facility producing all manner of metal work but after the collapse of E. B.Wilson’s Manning Wardle purchased the intellectual property and took on their good will. When Manning Wardle ceased production in the 1920s the goodwill transferred to Kitson, though this arrangement was short lived with Kitson themselves not surviving much longer. The Manning Wardle works site saw a number of industrial uses as well as making arms in the war. Next to Manning Wardle's Offices on Jack Lane we see the grand building that was once the head offices of the Hunslet Engine Company. This building is listed so hopefully should survive for many years to come. A blue plaque on the front of the building acknowledges its role in local history. The date above the door of the Hunslet office is misleading, 1864 being the year Hunslet began production, this office was built in 1882. When the Hunslet Engine Company was set up next door in a plot from the old Railway Foundry you would think there would be great rivalry. Hunslet Engine Company was set up by John Leathley, of a family with coal mining interests in the area. They already used E.B.Wilson engines on the Waterloo Colliery railway. When Hunslet built their first engines there was more than a passing resemblance to the E.B Wilson designed engines now being constructed next door at Manning Wardle's, in fact Manning Wardle were good enough to lend them wheel patterns. The person put in charge of the Hunslet Engine operation was in fact the eldest son of Manning Wardle’s director. It had been intended to keep the business in the Leathley family but there were clearly advantages to employing someone from an engine building background. The Hunslet works was altered many times over the years. Looking left on to Grape Street we see a massive building, this was the final assembly shop of Hunslet’s. The factory was expanded and modernised for an order of commuter trains built here in the 90s. A number of reliability problems with these units combined with problems amongst the group of companies which ran Hunslet were to see the end of train building here and the works has since been modernised again, this time for use making electrical components. The original erecting shop would have been situated immediately behind the 1990s erecting shop. Any surviving parts of the early factory buildings here were lost when the site was rebuilt after loco building had finished. The level crossings from the 1990s are still set in to Jack Lane. From the beginning of loco production here the locomotives would usually have been despatched by rail, often travelling under their own power on the main line. As the main line railways were rationalised it became more difficult to move shunters in this manner and the costs of using rail escalated. For many years Hunslet engines were dispatched by road. In 1984 the rail connection was lifted, having not been used in three years. It became necessary to reinstate the rail link in the 1990s for the contract to build commuter trains. Hunslet Engine Company were possibly the most successful company in the area, out surviving all the other companies, acquiring Hudswell Clarke's Railway Foundry and also parts of the Manning Wardle’s works. Part of Manning Wardle's works remained with Hunslet right to the end, in use as Hunslet’s final testing shop. Acquiring Andrew Barclay of Kilmarnock at around the same time as they took over Hudswell Clarke in the early 70s (making the most of a decline in the industry at the time) means Hunslet has a family tree that takes in much of Britain’s Industrial loco building industry. In the early 80s they took over Leeds firm Greenwood & Batley of Armley (nothing survives of their old works). Greenbat, as they became known, were a company that specialised in battery locos and electrical equipment. The name of Hunslet lives on to this day having been bought by LH Group of Burton on Trent. The new company overhauls and builds locos, including some new steam engines to the Hunslet 'quarry engine' design. In 2007 to celebrate the Leeds heritage of the current Hunslet Engine Company their second newly built quarry engine was named Jack Lane. This engine visited the Middleton Railway and a photo shoot was arranged next to the old Hunslet offices. On the opposite side of the Jack Lane to Hunslet and Manning Wardle there were two more engine building neighbours, though sadly there is little to be seen of these works. It is still possible to see where the rail link in to Hunslet’s works ran. To the left were the engine works of Hudswell Clarke where steam and diesel locos were produced. Diesel shunters were in production here until the 1970s when the firm was bought out by Hunslet. Hudswell Clarke made the sensible marketing move of adopting the "Railway Foundry" name previously used by E. B.Wilson. Nothing remains of their works and a modern industrial unit now occupies the site. 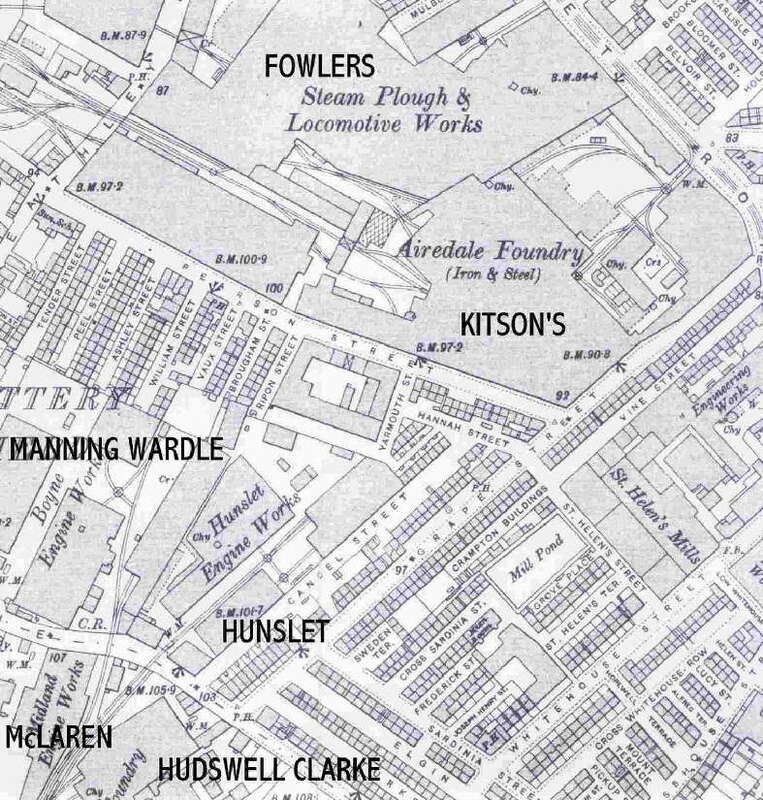 After McLaren moved to the former Kitson works Hudswell Clarke took over the Midland Engine Works site. Modern industrial units stand on the site of these works now, though a piece of the walls of McLaren’s works can be seen alongside the trackbed of the line that ran in to Hunslet’s works. Not far away in Pepper Street were Mann's Patent Steam Cart and Wagon Co another major manufacturer of steam traction engines and other road vehicles. A blue plaque also marks this works. (picture) Looking at the buildings we see that the offices were at the front of the complex with the works behind, typical of how many of the works were arranged. Where as the other works we have seen have lost their original workshops, this works has survived intact. 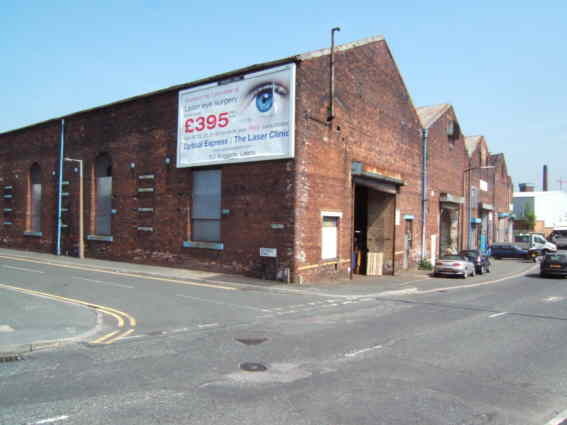 Immediately behind the former Mann works on Pepper Road is the former Yorkshire Patent Steam Wagon Co works. Famous for their distinctive double ended Patent Yorkshire Boiler they made steam lorries in this works from 1903 until 1931, later producing specialist bodies for commercial vehicles, a spin off from the various specialist steam lorries such as gully emptiers that the firm had produced. Remarkably the company retained the name until 1971 when they finally became known as Yorkshire Vehicles Ltd. The company closed in 1993. Though it has been rebuilt somewhat since the days of steam lorry production the works is now used by Pickersgill Kaye. Pickersgill Kaye continue to supply specialist locks for the rail, architectural, high security and custodial industries. Pickersgill-Kaye has also been involved in supplying components to railway rolling stock manufacturers across the world, even to far east based manufacturers Rotem and Hitachi. Several books have been published about the Leeds engine building industry, a list is displayed in the Links and Further Reading section.